Chatting at the tea urn the other day, we were discussing whether it would be possible to produce an all-encompassing specification guide to retractable seating for our customers. Probably not, we concluded; our retractable systems are so bespoke that the possible variations and combinations would be mind-boggling! From the discussion however, it did become clear that there are a few questions that come up again and again – to which we’ve compiled some brief answers below. 1. What IS retractable seating? In many years of trying to explain the concept, I’ve found that the fastest verbal explanation of retractable seating is “tiers of seating that close away like a chest of drawers”! However, the very best way to understand retractable seating is to forget the words and watch a short video. Take a look at our YouTube channel for a variety of retractable seating systems in action. 2. How many seats can I fit in my space? If you’d like to do a quick estimate, you can measure your space and use our handy Dimensions and Capacity Guide which you can download from the Datasheets section of our Resources page. However we’re more than happy to save you the time, and help you with this free of charge. We can either give you a quick seat count and visualisation based on your measurements, or a detailed CAD layout drawing based on a site visit and survey. We’re experienced in spotting particular features in spaces – sloped ceilings, inconvenient doorways and the like – and suggesting solutions, so it's always worth getting us in to take a look. 3. What type of floor do I need? 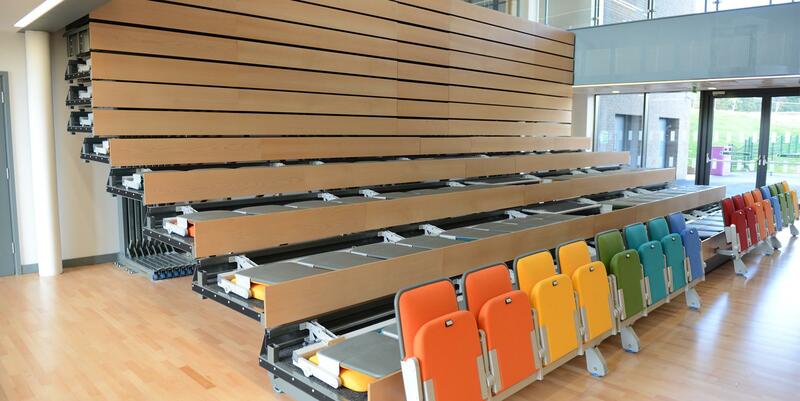 Hard floors – these are ideal for retractable seating but we still need to check the smoothness and tolerance. We look for a tolerance of ±2mm over 2m to ensure a smooth-running system. Sports Floors – Sprung sports floors are no problem, but we do ask for them to be reinforced just along the wheel runs. Please ask us for more information. Carpet - We don’t recommend running a retractable system over a carpeted area, but if unavoidable, we can provide custom made running boards to lay in front of your system before opening to prevent damage to the carpet. Parquet – It’s possible (although not ideal) to operate retractable seating successfully over parquet, but we do recommend a thorough check of your floor tiles prior to the seating being installed to ensure no damage is caused. Marmoleum – Marmoleum floors are acceptable but the marmoleum must be fully bonded to the substrate. Please do ask us if your floor is any other construction - we can also provide floor loading diagrams on request. 4. What standards apply to retractable seating in the UK? It’s a tricky one! Retractable seating often falls between a number of definitions – it’s not a structural part of a building, it’s not a staircase, and it’s not furniture. The standard BS EN 13200 provides good guidance for the design of a spectator viewing area, and part 5 in particular (“Telescopic Stands”) specifically covers retractable seating. Fire safety requirements, including aisle widths and safe numbers of seats to include in a row, are included in BS 9999 – Fire Safety in Buildings. Our UK industry association BASES also publishes a thorough guide to the design of a seating area. This is being updated at present, but the current version can be downloaded from the BASES website. The “Guide to Safety at Sports Grounds” (Known as “The Green Guide”), which is published by the Department of Culture, Media and Sport also contains some useful guidance, but this is primarily written with outdoor sports venues in mind. The chairs themselves are covered by BS EN 12727 – the strength test for ranked seating. A chair which enjoys heavy usage, for example in an arena or lecture theatre, should ideally comply with the highest level of the standard, grade 4. There are also lower grades for lighter usage. CE Marking regulations also effect retractable seating, and you should always check that any retractable seating specified carries this mark. Finally, the required load bearing capacity for safety rails is detailed in BS EN 13200 Part 5. If you need further guidance about standards, please just ask us. And don't forget, we can also manufacture seating to comply with international standards. 5. Does retractable seating need servicing? Be extremely wary of anyone who tells you a retractable system does not need servicing. They all require at least a yearly inspection, no matter how sturdily built. For one thing, it’s required in the UK under PUWER regulations, which state that working equipment must be inspected annually by a competent person and that records must be kept of those inspections. But there are many other good reasons too. During a service call, our engineers will subtly adjust platforms every year to ensure smooth running – poor adjustment can cause wear, which can lead in the long term to more serious and costly damage. They’ll also lubricate the system and replace any small parts or fixings showing signs of wear. In addition, our experienced engineers will also spot any signs of damage, which can be caused by all manner of events, from rubbish under the wheels, to incorrect operation by untrained personnel, to heavy objects being stored on the closed system. As with any mechanical system, investing in servicing will save you money in the years to come! We service all makes of retractable seating, so if you'd like to arrange a seating service, please call our Service and Spares team. 6. What is the difference between a bolted retractable system and a welded one? Whereas a bolted system such as ours would be delivered to your venue as what we like to describe as a “mechano set” and bolted together on site, a welded system will arrive as large subassemblies. While these unwieldy assemblies do slightly reduce time on site, there are multiple issues to overcome with logistics and manual handling – not to mention getting them into the building! The other reason we recommend a bolted structure is that over the lifetime of the system, a bolted system can be adjusted with far more accuracy and finesse. These small adjustments, which our engineers perform as part of your annual service, are essential to the long-term reliability and smooth running of the system. They also prevent any more serious damage, wear and even breakdowns in the long term. Also please note that although “welded” may sound stronger than bolted, in actual fact the small amounts of “give” built into bolted systems help them to manage loads more effectively than a welded system. 7. Aren’t retractable systems noisy? Not all retractable systems are noisy! But some are. The worst-case systems rest open with the front beam of one platform resting on the rear beam of the platform below. This reliance on metal-to-metal contact makes the systems noisy and prone to wear and distortion. Our platforms make contact at seven discrete points; at each point a nylon pad or roller cushions the contact. Along with our rigid deck construction, this reduces noise when opening, closing or walking across the platforms. 8. What holds a retractable system safely in place once open? Most (but not all) retractable systems have some kind of mechanism for holding the rows safely in place once open. Many are gravity operated. Our row locks are gravity operated, but with the additional backing of a spring and an extremely sturdy construction. This ensures safe and secure locking, even in earthquake prone zones such as New Zealand and California. 9. What if the chairs fold down by accident? Before or during the closure of a retractable system, each row of chairs has to fold down onto its platform - allowing the chairs to be stored inside the closed platforms. It’s almost impossible for Audience Systems’ chairs to be folded down by a member of the public – either deliberately or by accident. Beware, however, of chairs which are folded via a highly visible foot release pedal. These can easily be released by accident - or indeed by curious children. 10. Can I upgrade my seating after installation? It is, of course, most economical to get your specification right when you purchase the system, but circumstances change and all things are possible! We've retrofitted many operational upgrades to retractable systems, including the power operation and partial opening functionality. Existing systems which are showing their age can also be refurbished – so if your seating platforms are working well, but decks, chairs, trims, fascias and/or rails are showing their age, a complete replacement is not always necessary. There are also a few options for increasing your seating capacity, whether through adding an extra row of seating, or purchasing matching seating which can be laid out on the floor in front of the retractable platforms. If you’d like to investigate further, our Service and Spares Department have undertaken all manner of retrofits and refurbishments, and can offer free advice with no obligation.